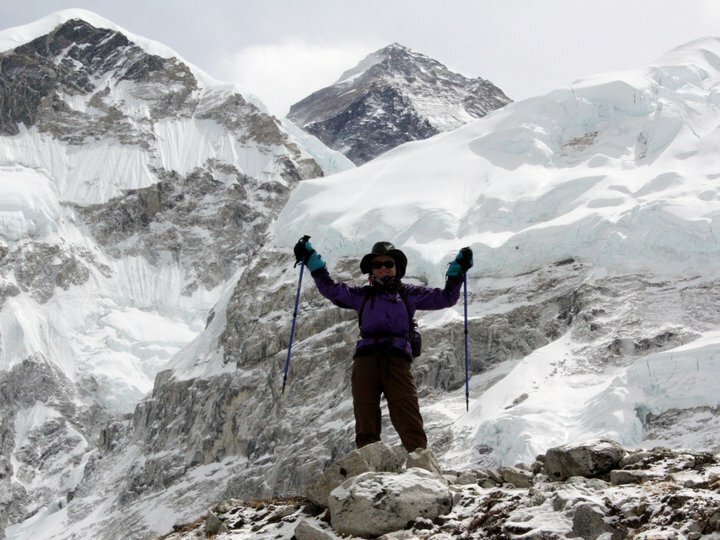 Karen Parman with Mr. Everest behind her. Karen, a member of Covenant Reformed Church (URCNA) in Pella, IA, was one of 13 cancer survivors who hiked to Mt. Everest’s base camp in April of 2011. Dr. Richard Deming, Medical Director of Mercy Cancer Center in Des Moines, IA, organized the trip and recruited survivors to participate in it. A highlight of the trek was its meaningful “Relay for Life” commemoration at 17,600 feet above sea level, the highest elevation at which a celebration has ever been held. Fear of primitive swinging bridges wasn’t the only terror Karen anticipated. The group flew from Des Moines to Chicago to Abu Dhabi in the United Arab Emirates, where they had an 18 hour layover before flying to legendary Kathmandu in Nepal and on to the world’s most dangerous airstrip at Lukla. 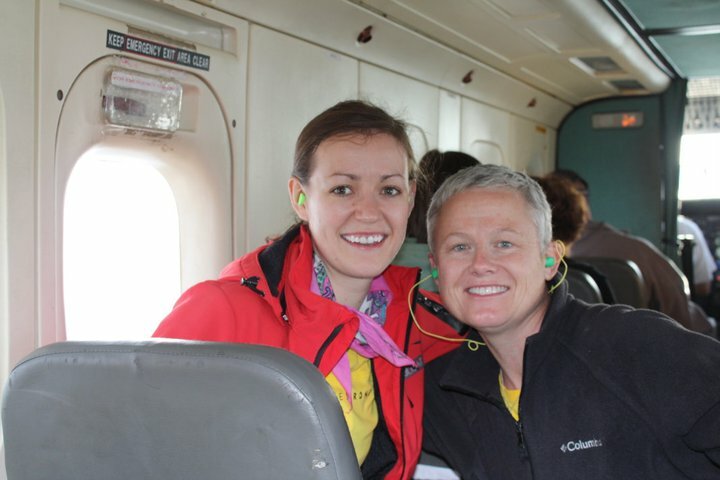 Margo Tomka and Karen on the plane leaving Lukla, the world's most dangerous airport. Eleven years before the Mt. 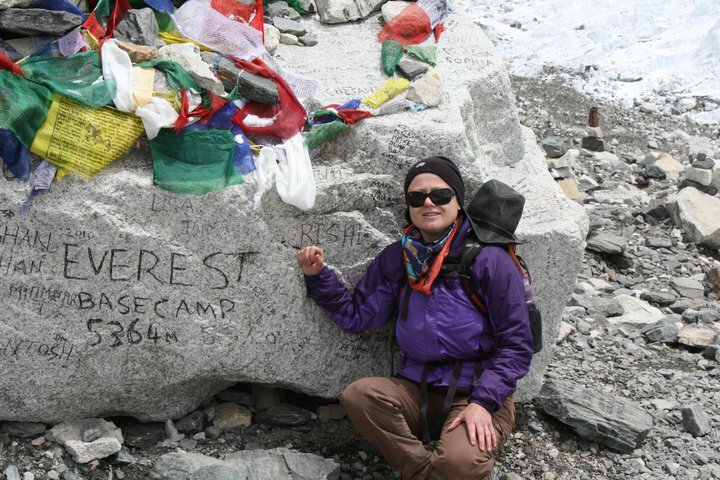 Everest trek, Karen experienced a sudden rush of terror when she learned she had cancer. She recalls “a defining moment” in her faith when she cried out to God. Karen was always an active person, raising and riding horses, but she began to run as part of her recovery regimen. Her running partner lived next door to a homeschooling family that Karen couldn’t help noticing. Karen relates that the Wood family once went with her family on a home school field trip, but that they lost contact after the Woods and Karen’s running partner both moved out of town. That is until Karen learned that the oldest Wood son, Blake, had been diagnosed with Ewing’s Sarcoma. As Karen prepared to leave for her Mt. Everest trek, Blake weighed on her mind. She printed a card in his honor to take to base camp with a plan to send him a note and picture after her return, but somehow that just didn’t seem like enough. She describes how hard it was to see the former dynamo of boyish exuberance with a thin face and thinning hair, reclining with an elevated leg due to bed sores and hooked up to a beeping pain pump. Karen sat with the family as they discussed what it’s like to walk a cancer road. Karen explains that Blake had gone from a diagnosis with a hopeful cure rate, to an unexpected recurrence, to being part of promising clinical trials that closed due to lack of funding, and other emotional ups and downs during his cancer treatments. At the time of Karen’s visit, he was recovering from Cryoablation surgery and undergoing additional chemotherapy. As departure time approached and Karen increasingly faced the fear of the unknown, she recorded her emotions in her journal. Recognizing that unfounded fears always visit her in the middle of the night, she snuggles closer to Matt, her husband of 26 years and prays for daughters Meghan, sleeping in the next room, and Allyson, in her first year at Iowa State University. As Karen’s eyes adjust to the faint moonlight, she sees the shape of her suitcase “standing like a sentinel waiting to be called into duty.” She mentally goes through a checklist of what she’s packed and repacked during the last two weeks. She wonders how to keep her passport safe. She realizes how much she’s come to appreciate and admire the other members of the team during their training sessions. 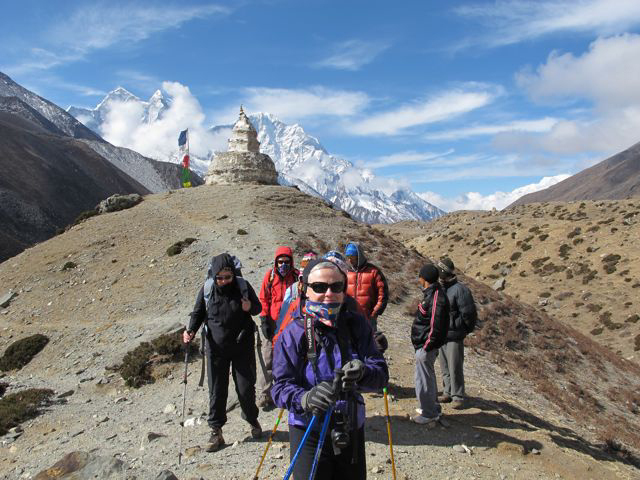 She imagines their camaraderie on the trek and envisions herself during the experience. The most overwhelming impression that tops Karen’s list from the trek: cold. Second on the list: fatigue. A few significant events also stand out in Karen’s memory of the trek. The most difficult climb was on Day Two, hiking to Namche Bazar. Day Three began with another uphill grind, but once the group reached the top of a huge ridge, the land leveled into a wide expanse of inhabited land. Karen describes the area as immaculately kept farms bordered by stone fences, punctuated with stupas (mound-like structures typically containing Buddhist relics and used for Buddhist worship), and surrounded with spectacular mountain vistas. After the difficult Day Two climb to Namche, Karen began experiencing excruciating effects of the altitude. During the trek to base camp, trekkers lived in superlatives. They viewed the most incredible beauty of creation. They pushed their bodies to physical limits and beyond. They rode emotional roller coasters steeper than the mountains they climbed. 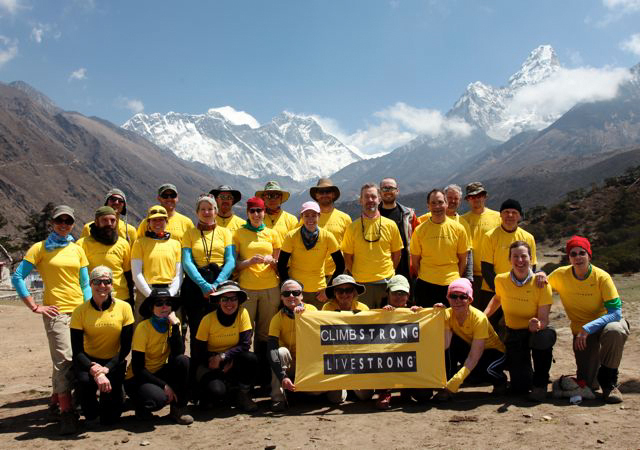 After nine exhausting days, 13 cancer survivors and 14 supporters reached the base camp of Mt. Everest, located at an elevation of 17,600 feet. But at night, Karen saw the camp transformed. The next morning the hikers celebrated their accomplishment with the highest ever American Cancer Society Relay for Life. Over 300 prayer flags were strung together as a memorial to loved ones who had lost their battle to cancer or were still fighting it. The red flag Karen had carried all this way in honor of Blake Wood fluttered between a white and green flag in the colorful string. 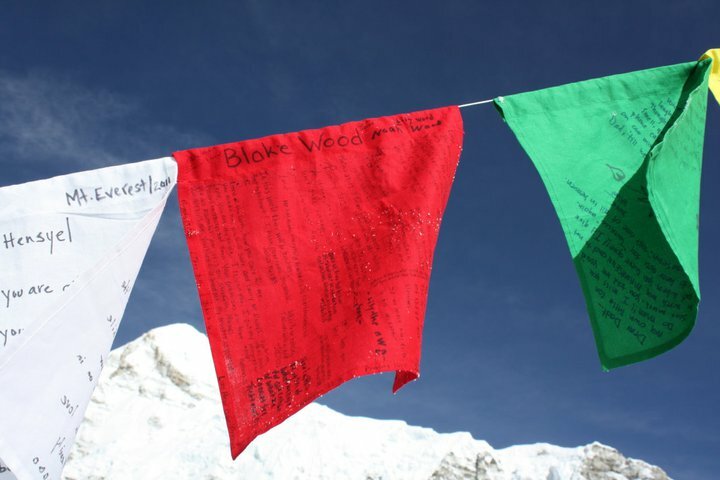 The trekkers lapped the flags in a silence broken only with soft sounds of hugging and weeping. Of all Karen’s memories from the downward trek, the group’s stay in Phakding seems most significant. The group had lodged overnight there on the trek up, but on the return trip stayed only for lunch on their last trekking day. The remarkably pleasant weather contributed to the group’s celebration of accomplishment. Horses have always been a big part of Karen’s life, and she enjoyed the extra blessing of watching a colt about a week old explore his new surroundings. Leaving the spring-like weather of Phakding was also a bittersweet moment as Karen witnessed a harbinger of change. Karen and the other members of the team became close to the Sherpa porters who carried supplies up the mountain with them. The porters did daily exercises with the trekkers in the morning and sang with the group at night. After Karen had time to process all the emotions and information from the trek, she listed six ways it impacted her. The above article by Glenda Mathes appeared on pages 10-14 of the August 24, 2011 issue of Christian Renewal. Wow, I wept through this whole article. Thanks for writing it. Praise God for his faithfulness, to bring glory to himself and good to us, in this trek of life that is so often painful and frightening. Thanks for reading and responding, Sally! I still cry every time I read this article, too..
As I read this, it brought back memories and feelings I had hidden in the back of my head. I will be a 3yr. Breast Cancer survivor this coming October. Karen and I have been friends for many years. She was an angel God sent to me while I was fighting the fight. Seeing her and knowing SHE did it! SHE fought the fight and WON! SHE told me that I was never alone. God was right here with me every step of the way. So as I read this article and got to the one sentence that made me cry and get goosebumps…”Scott walked behind me offering quiet encouragement and telling me that I was doing great.” I thought… wow, that was Karen during my battle. As Karen says she considers her cancer “The Terrible Blessing”, I too say my cancer was a blessing. Some may never understand that, but as a cancer survivor and walking that path, you soon realize, that it’s people like Karen Parman that are the blessing. God put her in my life for a reason. She not only conquered Mt. Everest, she conquered Breast Cancer and became an inspirational angel to many! Thank you Karen for doing this trek, for continuing to be an inspiration to many. Thank you for praying with me and for me.